Went to my Hadassah chapter's Member Appreciation dinner last night (Hadassah is a volunteer Jewish women's organization that raises funds for hospitals, education and medical aid in the US and Israel as well as other countries). I call it my chapter because I'm one of the co-presidents. But as the only co-president in attendance that did not have a nasty cold and cough last night, I had the honor of giving the entire presidents' speech. Thus, I was forced to spend maybe 2 whole hours writing the speech (good lines aren't just waiting for me on someone's website to simply lift, ya know). No, seriously, it might have been 3 hours, counting major rewrites and minor tweaking. I'd like to thank Pioneer Woman for this very elegant yet easy dessert. Just. Three. Whole. Ingredients. And the mixer stays in the corner gathering dust! Woo-hoo! 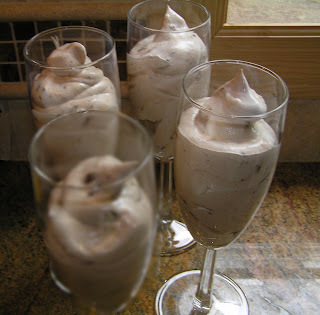 Beside being easy, this mousse is also very versatile. It tastes great immediately after whipping up a batch, and can be served immediately if you are in a hurry or impatient. But then of course you will have to rename it Chocolate Almond Mousse. If you have the time, freeze the mousse in the serving dishes you plan to serve them in, or else plan to scoop them out and call 'em Chocolate Almond Frozen Mousse Balls. So you see, it's really up to you. If you don't have strong brewed coffee lying around, mix 2 tablespoons of cool water with 1/2 teaspoon of instant coffee. You don't really taste the coffee, but it enhances the flavor of the chocolate, so don't omit it. I made only a couple of microscopic changes in the recipe that follows, but this is still 99.44% pure Pioneer Woman. So there. This is a slightly different version of a chicken and potato recipe I had posted a while back. This recipe tosses in apples and dijon mustard. It also tweaks a few of the steps, including cutting up the potatoes and onions into chunks instead of thin slices. If I had to vote on a favorite, I would pick this version because the hint of dijon mustard enhances the potatoes. Plus thinly slicing the veggies, pretty as they are, takes a lot more time, even with a mandolin.